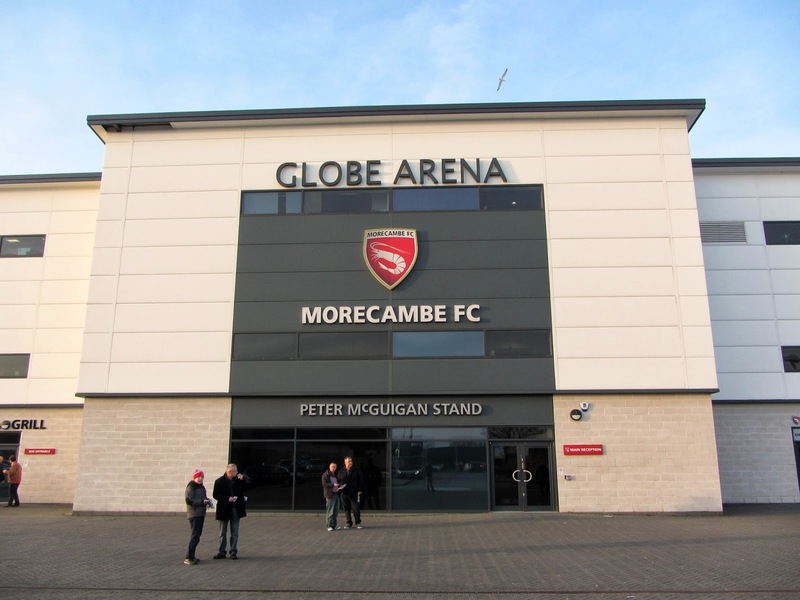 My third stadium of 2014 was on Saturday 8th March at the Globe Arena in Morecambe, Lancashire. The match was Morecambe vs. Southend United in Football League Two. 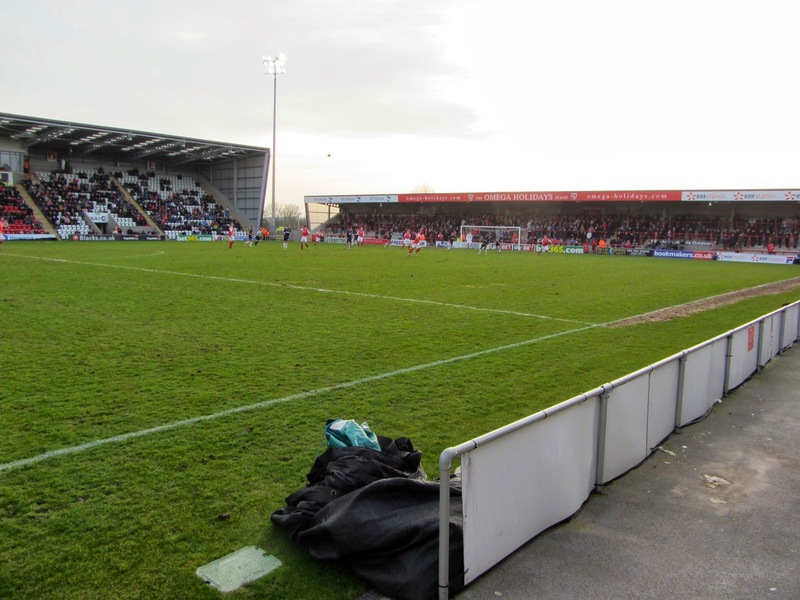 The Globe Arena is adjacent to the Sunnyside camp site to the east of the town centre. 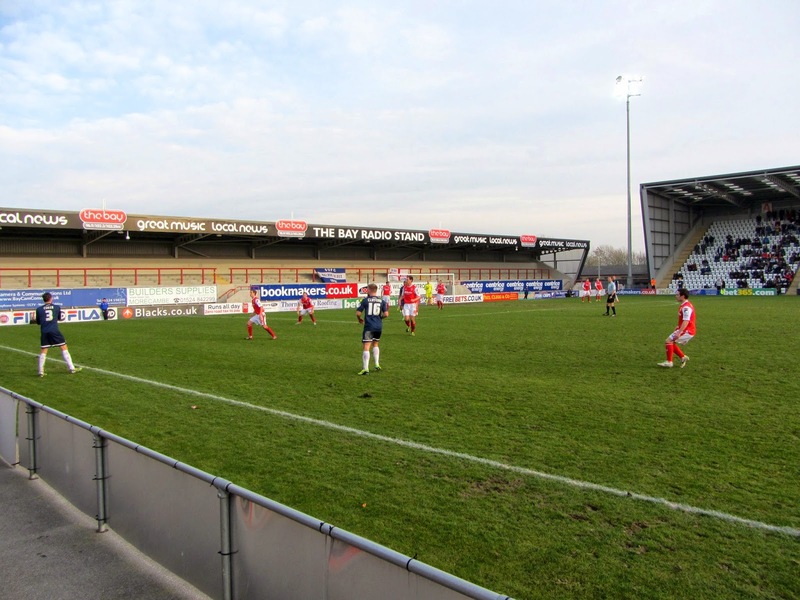 The ground is around 1.5 miles from Morecambe railway station and has been home to the club since 2010. This was the year when Morecambe left their Christie Park home where they had played for the previous 89 years. The stadium is dominated by the Peter McGuigan Stand which is the only seated area in the venue. This 2,173 seat structure is by the far the tallest in the ground and contains two levels of hospitality areas in the centre. The section towards the eastern end of the ground is given to away fans as the designated away terracing is often closed. The reception, club shop and ticket office are also contained within the Peter McGuigan Stand. The remaining three sides of the ground are taken up by terracing. Opposite the Peter McGuigan Stand is the North Terrace which is an uncovered stand with two separate areas of concrete terracing with room for just over 600 fans. In between this is a food outlet and toilets and the back entrance to the stadium which leads out towards the training pitches at the back of the complex. To the right of the North Terrace is the West Stand which is the main terracing area for home fans. This covered stand can accommodate 2,234 supporters. At the opposite end of the pitch is the East Stand which is the away terrace with up to 1,389 fans able to fit in here. 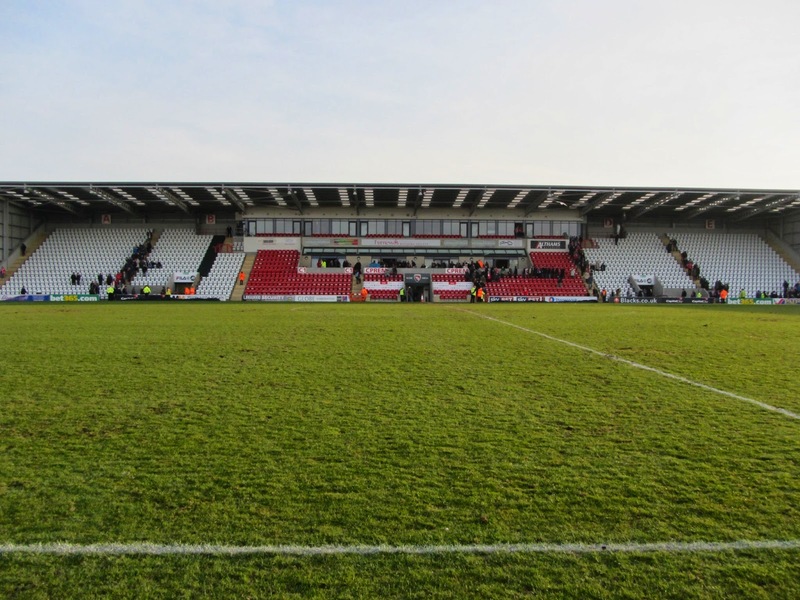 Both sides went into the game on poor runs with Southend without a win in the previous eight games and Morecambe without a win in their previous ten games. The visitors started the better of the two sides and were able to grab an early lead in the 9th minute when Kevin Hurst's cross was met by Ryan Leonard who headed past the dive of Morecambe goalkeeper Barry Roche. The home side were barely in the game for the opening half-hour as Southend looked for a second goal to assert their dominance. In the 29th minute Morecambe equalised out of nothing - Padraig Amond swung a hopeful ball into the box but a mix-up between Southend's Daniel Bentley and John Egan resulted in them both leaving the ball for each other. Morecambe forward Kevin Ellison reacted quickest to head the ball away before finishing well from a tight angle. This completely turned the game and from this point on Morecambe were easily the better side - they put Southend under pressure for most of the second half and in the 70th minute scored the winner. Shaun Beeley twisted and turned his way through the visiting defence and as the Southend defence congregated around him he was able to laying the ball off to the unmarked Jack Redshaw who stroked the ball into the bottom corner.